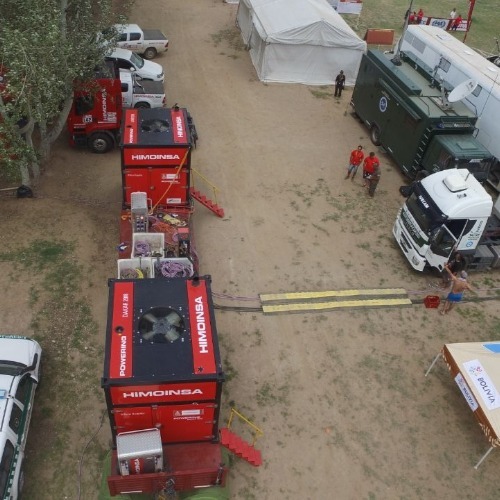 Special configuration: Redundant power supply to serve the 10 camps set up by the ASO along the 9,000-kilometre race, with dual-frequency generator sets prepared to withstand the course's adverse temperature, rain and sand conditions without diminishing performance. 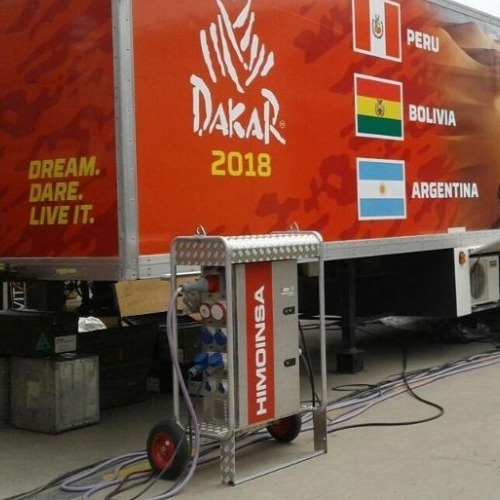 HIMOINSA, the official energy provider of Dakar 2018, provided a total of 8.5 MW of energy to supply the 10 camps set up along the 9,000-kilometre race. 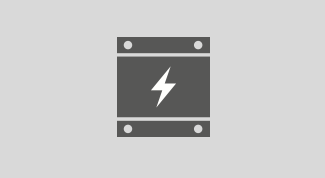 Six Power Cube dual-frequency generator sets (two per camp) guaranteed the proper functioning of all services to accommodate the 2,800 people of the organisation, as well as the services of the camp hospital, the sport television retransmissions and the geolocation systems of the drivers during the races. 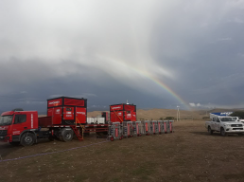 The HIMOINSA Engineering team designed a mobile energy supply with three independent technical units composed of two Power Cubes and a technical team of 5 people in each of these units who worked in the installation, commissioning and transportation of the groups. In total, some fifteen people (engineers and technicians) provided services throughout the entire rally. 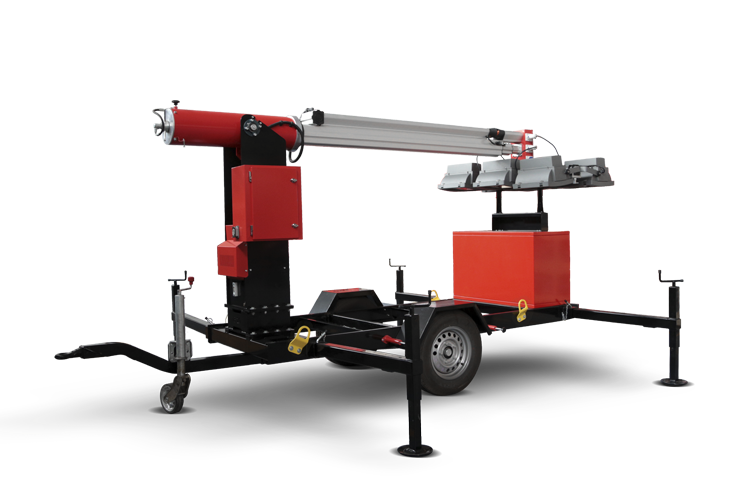 The generators supplied up to 503 kVA (50Hz) or 524 kVA (60Hz) of PRP power. From the moment the race started, both units worked in parallel to ensure an uninterrupted supply to the television retransmissions and the monitoring system for the vital signs of the drivers, which allowed, via satellite, any emergency to be identified throughout the entire route. For the rest of the time, the second group acted in case of an emergency, prepared to operate in the event that the energy demand of the camp increased. 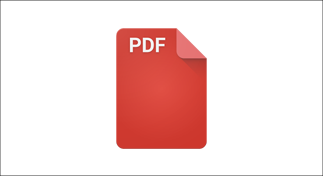 Provide continuous power to each of the camps set up by the Dakar organiser during the race. The route crossed countries with electric network frequencies of both 50 Hz and 60 Hz and diverse weather conditions, going from desert to mountainous areas. 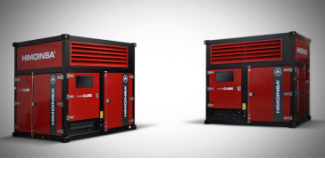 Six Power Cube model HPCW-500 D5-6 dual-frequency generator sets, with an FPT engine and Cramaco alternator, capable of supplying power of up to 1 MVA when working in parallel. 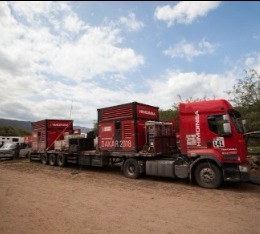 All Power Cubes had an internal fuel tank with a capacity of 875 litres and an automatic oil replenishment system. In addition, they included 2,000-litre external tanks to guarantee the power supply in any eventuality. 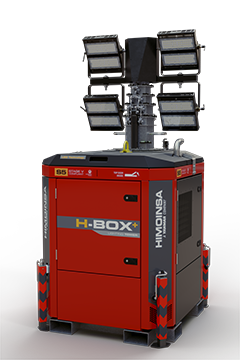 HIMOINSA also made two reserve generator sets available, with the aim of offering maximum guarantees at all times. 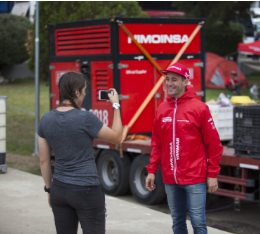 "Being away from the power grid, the generator set had to guarantee a reliable and safe energy supply throughout the route", explains Mario Dovo, Head of Operations HIMOINSA Argentina & Cono Sur. 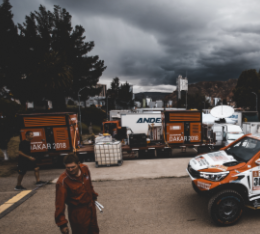 "This modular supply allowed the technical team to always work with two camps in advance, resolving any eventuality beforehand, maintaining the frenetic pace of the race". 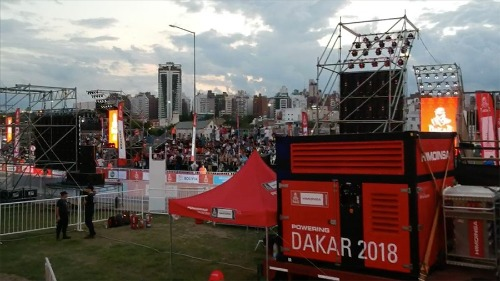 The Dakar camps are travelling operations centres from which accommodation and services are provided to all race organisation staff, the sports teams of the participants and international media, as well as the health services necessary for an event of this nature. 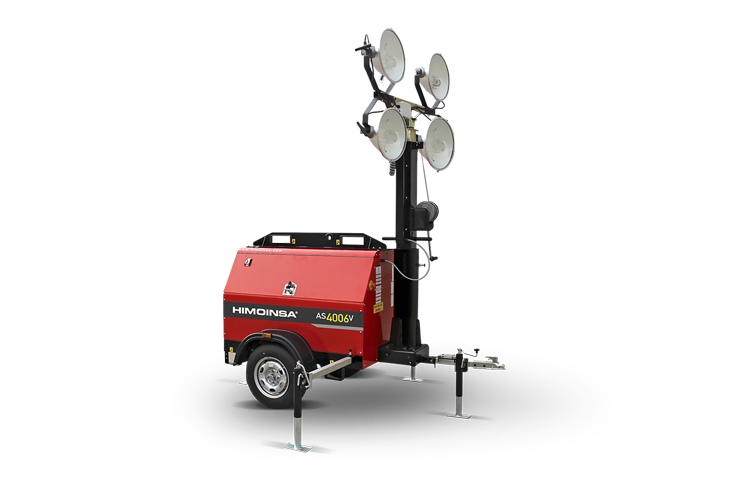 For the supply of each camp, with an average expanse of 1,000 square metres, HIMOINSA supplied eight distribution boxes made of aluminium, which significantly reduces their weight, and mounted on a two-wheeled transport device. This way, we used mobile distribution boxes which were easy to handle to transport the energy from the Power Cubes to the camps' different points of demand. Each board has 16 power points for industrial use. Additionally, one of the eight boards supplied to the camp was configured exclusively for television use. 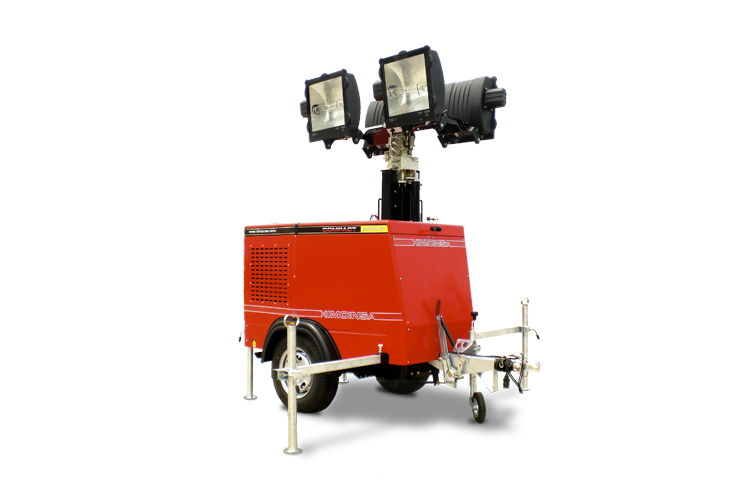 The generators incorporate an FPT C13TE7 engine. Their electric radiator was fitted with a frequency changer that adapts its speed depending on cooling needs. This not only reduces the level of noise emissions, but optimises fuel consumption, thus leading to the generator set running more efficiently. 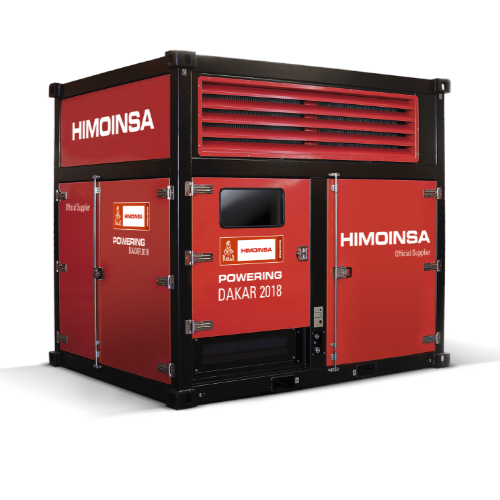 The HIMOINSA generator sets were designed to withstand the adverse environmental conditions presented by the rally route. 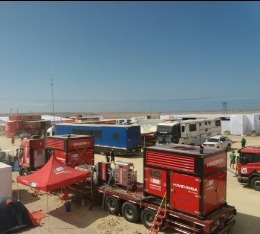 According to César Rodríguez, Project Manager at HIMOINSA, “the data obtained during the testing of the equipment before leaving the factory were optimal and the experience in the field has corroborated it: the performance of the sets was not diminished at any time, even though they had to endure conditions from the high temperatures of the Peruvian dunes to the persistent rain of the Bolivian Plateau". In this sense, the six Power Cubes were equipped with a non-metallic, compact air filter, which offers high filtering capacity and is ideal for equipment operating in medium to heavy dust environments. To achieve better space optimisation, the cooling system of the HIMOINSA Power Cubes were installed on the upper part of the canopy. 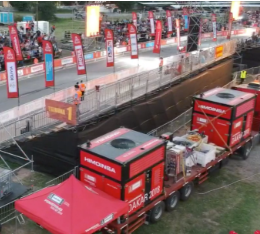 Its compact dimensions, in 10-foot containers, greatly facilitated transport and logistics during the days of the race, making it a particularly suitable generator for this type of event. 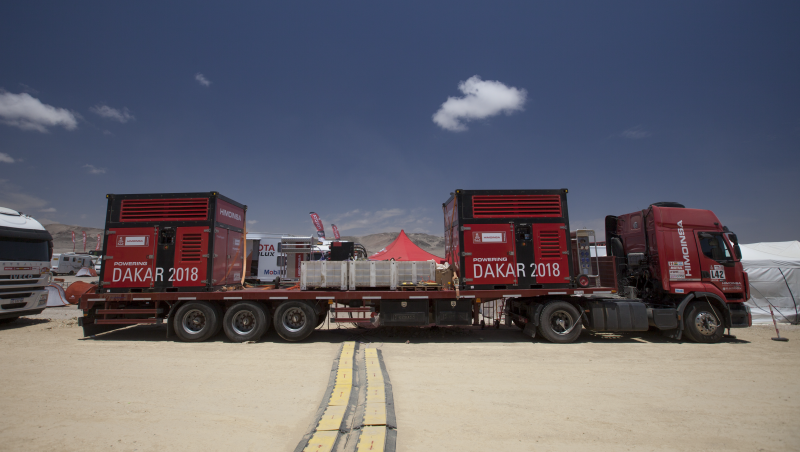 The Dakar logistics director, Thomas Cerf-Mayer, greatly appreciated the work done by the HIMOINSA technicians as well as the performance of the generator sets during the almost 15-day race. 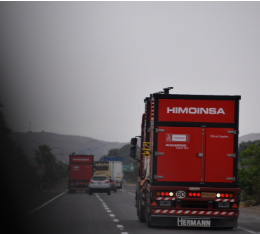 HIMOINSA was chosen as one of the leading generation brands in the market, and the result obtained has corroborated the reliability of its equipment and the rigour and experience of its technicians.